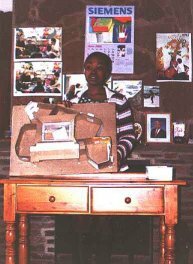 Tsepho Dube, a 15 year old pupil of the German School in Johannesburg, spent two weeks on work experience with Children of Fire. Her heart's desire is to be an architect. What she wrote is available in a number of translations (above) and in the section below. Other young people have come to the charity for Community Service, in South Africa. Such initiatives are only run by a few schools in Greater Johannesburg (where the charity is based), but each of the young people who has been here so far, has benefited from the experience at least as much as we have benefited from their efforts. Georgina Westcott (15) came somewhat sporadically for just an hour or so at a time. She mainly helped with physiotherapy (with guidance) for Dorah. Of her own initiative though, she brought a box of sand and sea shells for Dorah to play with, to give her the feel (and to a lesser extent smell and taste) of a very different environment. Her family donated second hand clothing to survivors of squatter camp fires. Tarryn Kelly (14), the daughter of a plastic surgeon, also mainly helped with an exercise regime and playing with Dorah. She brought her younger sister along and as a result, their school St Mary's went on to collect little Easter eggs for us to take burned children in hospital; to make puppets and to make tiny story books for injured children, and also to collect some money. Tessa Richardson (17) from St Peter's, was older and has since gone on to study medicine. She admitted that the primary reason for helping initially was because it would "look good" on her CV, particularly with the highly sought after places to study to be a doctor. She helped with Dorah and really warmed to the little girl. Tessa also persuaded other pupils to help put plants in a squatter camp. We had hoped that, with the medical nature of our work, she would stay involved, but this no longer seems to be the case. Her mother Sue, though, gave books to the squatter camp library, handed on clothes for squatter camp fire survivors, and helped with a French translation for the website. The better-educated children tend also to be the richer children in South Africa, and so, being brought up with home cleaners and gardeners, they are not particularly keen or competent at the messy work of looking after injured children. But oaks from acorns grow and maybe some saplings will come through this scheme. As Ithemba publishing's activities have largely been usurped by those of the charity, the regular publishing trainees sent here each year have also contributed in part to the charity. Liz Salberg (22), Kirsty Buchholtz (23) and Ichizu Wakabashi (14 but exceptionally bright) helped in handing out burns dressings, improving the literacy of squatter camp residents or counselling/befriending traumatised burn survivors or their families. Ideally we would like a UK-educated Gap-year pupil or VSO, or a Peace Corps volunteer from the USA, to assist us in a longer term, more sustainable way, but each person that helps the charity undoubtedly raises awareness of our work in their own homes, schools or colleges, and that can only be good. The vocational training, which included weekends, started in May 2000. While Bronwen Jones normally runs a charity that helps burnt children and also publishes books, she had agreed to give me architectural training. My vocational training has changed my outlook on life. During the two weeks I spent my time designing a house for a disabled girl called Dorah and I had to spend some time with her in order to learn more about her - what she can and cannot do. for your information it takes about 18,000 bricks to build a medium-size 3 bedroom house in Auckland Park, if all walls are two bricks thick. I had to draw a front elevation and side elevation and I had to walk around the suburb looking at different window designs as well as invent some of my own. I had to think about which was the house faces and why the north side is warmer. The fourth day was however different because I had to see and learn what Dorah, who I had to design a house for, could do. This included helping her eat as she needs a prosthesis to hold a spoon, and taking a walk to the post office with her and Bronwens nine year old son Tristan. That was probably one of my most interesting Sundays mainly because I was doing something good and not only for Dorah but for me as well. Taking her to the loo really just needed me to guide her and to make sure that she did something! This short time helping a child like Dorah makes a difference. Dorah was involved in a shack fire and was left without proper hands, eye lids, a nose, and proper lips. 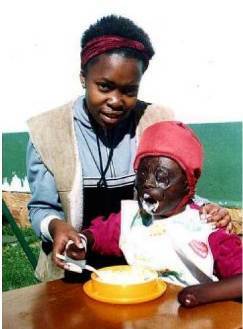 She has been living with her scars and a badly burnt face for six years now. She has been living with Bronwen and has been through 24 painful and expensive operations, which by the way were all done in Britain and were paid for by the people there. Lips have been made for her from the skin and tissue of her back, which allows her to eat solid food but it is hard for her not to dribble and hard for her to shape words, and skin was taken from her neck to cover her eyes. Dorah has three different noses, which were made for her and which she wears every morning before she goes to a nursery for disabled children, situated in Hillbrow. She also wears a little red hat every day because, part of her skull was melted by the fire. The accident has made it impossible for Dorah to do most of the things a normal six year old can do. I was only there for two weeks but I learned that everyone needs and deserves to be loved, especially disabled children. I have learned that there is more to life than going shopping and caring about what the next person thinks. Being with people who are so loving has made me see that maybe our country has hope, that maybe if we stopped just for one minute to think about all those people, especially children, who need to be loved and if we actually did something about it, South Africa wouldnt have so many abandoned children. I had to design a house that would be user-friendly to Dorah i.e. have all the thing she can be able to use as a child as well as when shes an adult. When designing this house I had to take in consideration the fact that Dorah would be living in this house from when she was a child and would be able live in it until she felt confident enough to live somewhere else. Maybe she would live there for ever. When designing this house I had to work out how many rooms would be suitable for a little girl like Dorah to be able to get used the new surroundings as soon as possible. The house had to be one that would have enough space, which would enable more than one inhabitant. So I after taking all the information I had into consideration I decided to design a well and brightly furnished house with 2 bedrooms, a kitchen, a dining-living room and bathroom. The 2 bedrooms would have bay windows and would each have a door leading to the bathroom  this is especially good for a child like Dorah when she needs to use the loo. Dorah's bedroom will include sliding doors leading to the garden. This room will be the most interesting as it will be the most colourful, this is to help Dorah identify all the contents of her room including the room itself, and the most fun to work on. Because of Dorahs weak eyesight most of the house has wooden floors which will enable her to hear her footsteps and where shes going. Wooden floors cost six times more than a concrete slab as a floor but the initial high cost is worth it because of the benefits to low vision people. Her bedroom will have a musical carpet though which makes a different sound each time she steps on a different block. The next most interesting room I dealt with was the kitchen and because I gave this particular room so many corners I will have a lot of walls on which I will have to work. This room will also involve a lot of colour. What must take into consideration when designing a house is that a fire can emerge from anywhere and at any time so installing fire doors is a faultless must. These are doors that are much thicker than the normal and allows a person more time to escape from a fire. Also the house must be usable by any ordinary or disabled person so it has doorways big enough for wheelchairs, and a ramp as well as steps leading to each of the two external doors. There will be two main entrances which will be through the kitchen and the dining room. Both these rooms will be brightly painted - to help Dorah distinguish between the rooms and the contents of these rooms. This house would have like most houses a garden outside the house, it will also have one inside mainly because Dorah will have easy access to it and because she will be safer playing inside the house than outside. The inner garden is also really to give the house a wonderful and very interesting feature to add into the design of the house. The inner garden is a beautiful feature - and it will be surrounded by sliding doors leading on to two rooms, but visible from most rooms. The most interesting and difficult part of designing this house was the roof, because the garden would have an open roof meaning it would be built inside, but still get as much sun and rain as if it were outside. On the edges of the open roof of the garden there will be gutters and inside the garden there will be two barrels placed on two of the opposite corners. So when it rains the water that gets into the gutters will flow straight into the barrels and in return, this water will be used for things like watering the garden and as a backup supply of washing water or even drinking water for the house. This is to help the reduction of water  SA needs as much water as possible due to its water shortage. The angle of the roof and gutters was hard to invent. The kitchen will have a bright kitchen unit with dark edges and light colours inside. Contrast helps low vision people to find things. All around the room the lowest drawers will be upside-down pull-out drawers that have a very strong bottom which should be able to sustain Dorahs weight and allow her to use them as platforms in order to help her reach things like, the fridge, the microwave, the stove etc. and these platforms can be turned the right way up to use as drawers again when shes older and taller. I made a model to show how this works. Kitchen appliances will have big round buttons and levers that Dorah can use without fingers. The house will have photovoltaic solar panels in part of the roof. Every adult height light switch can also be turned on with a big button to kick at child height. All the light bulbs will be energy efficient. These might cost a lot but last longer than normal light bulbs. And even though it will be expensive to build, it will be a very low maintenance house i.e. cost as little as possible to run. This house will have two bedrooms one of which will be Dorahs, this bedroom will have two doors, one will be the main entrance into the room and the other one will be leading into the bathroom, this door will give her easy excess into the bathroom, it will also include a bay window, a recess forming window, and a sliding door leading to the inner garden. The other bedroom will also have a bay window only it will be bigger than the one in Dorahs bedroom, this room will have like Dorahs one door that will be leading into the bathroom. This bathroom with two doors leading into the two bedrooms, will be brightly painted and tiled with two water-saving toilets and one chooses to have a single flush or a double one. One toilet will be for adults and double-up as a bidet (that makes is easier for disabled people without fingers in particular to wash their bottoms) and another for children, and a bathtub, which will enable Dorah to use it as a child and most of all as an adult. There might even have a shower. Little children find it hard to get onto lavatory seats. It makes sense to have a small toilet next to the big one. Even Dorah is sometimes scared of falling in. The other thing that I had to add to my design was 5 different rubbish bins each with a purpose e.g. one for plastic, another for paper, glass, ordinary rubbish that cannot be readily recycled, metals and compost for the garden. External doors for the main entrances each cost from R500 to R900 or more. Building sand per cubic metre costs R75. Fine sand and coarse sand will be needed for different jobs. There are lots of other costs like for safety glass for big doors (so that Dorah doesn't hurt herself if she walks into them) but I ran out of time to get all the prices and to work out the sizes. N.B. if you need to know the actual amount of money the building materials for Dorahs house will cost you will have to do the maths. I had to phone builders merchants to source materials and to cost them.